Why do your customers like you? What are the things about your business that bring people into your store – and more importantly, what are the things that keep them coming back? If you’ve been in business for very long at all, you’re doing a lot of the right things, and you’re doing a lot of things that your customers like. You need to make sure that you know what those are, so that you can keep doing them, and so that you don’t wind up doing anything that gets in the way of what you’re doing right. More than a few businesses have run aground because they made some well-meaning “improvements” to longstanding practices – and unknowingly wound up doing away with the very things that customers had liked the most! Client satisfaction surveys can give you an accurate picture of your business’ strong points, so that you can build on them, and make them work for you. Which store specials and promotional campaigns matter most, and which matter least to your customers? This will help you separate the wheat from the chaff. if you’re putting time and money into a promotion that your customers really don’t care about, you need to know that. And if there’s a sale that they look forward to, or a special offer or promotional campaign that hits the right note with them, you need to know that, as well. A customer satisfaction questionnaire prepared with the help of the survey professionals at Compechek can actually rank your sales and promotional campaigns in terms of customer preference, giving you a clear picture of where to put your time, money, and effort. When customers do leave, why do they do it? When your customers do leave, you definitely need to know why. You also need to know how to prevent customers from leaving, and when possible, what the specific problems are which drove individual customers away, so that your store managers can take care of those problems on an individual basis – and as soon as possible. Understanding why customers leave, and which customers have left, or are on the verge of leaving, is the key to customer retention management. 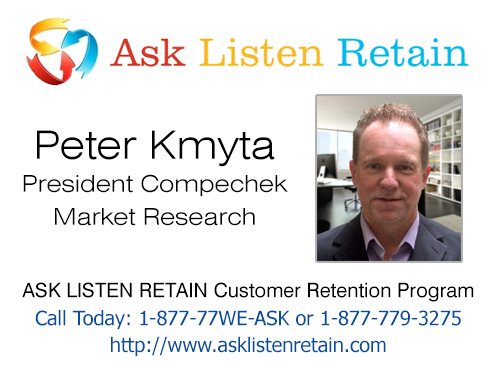 Compechek’s ASK-LISTEN-RETAIN system will tell you what you need to know about your customers, and give you the tools to keep them satisfied.